While it might not be the pressure of needing to hit the game winning shot with 0 seconds left in the championship game, our exhaust fans are under a different pressure to perform – Static Pressure. The dictionary defines it as: “The force per unit area that is exerted by a fluid upon a surface at rest relative to the fluid”. If you are like most people, that doesn’t really clear it up – especially when it comes to ventilation. I thought we are moving air not fluid? The very basic definition is how much pressure is exerted to move a given amount of fluid a defined distance. For airflow (ventilation measured in Cubic Feet per Minute – CFM) that means how much CFM is needed. For instance a fan might move 100 CFM at 0” of static pressure. When the static pressure is increased to 0.1” the same fan might only move 90 CFM. Duct size: This is a case of bigger is better. The wider the duct, the easier it is for air to flow through it. Think of one of those small coffee-stirring straws. Try to blow as much air as you can through it. Have you turned red yet? Now take one of those large milkshake straws and exert the same amount of energy blowing air through it. Not even a comparison. This is exactly what is happening in your system when you use smaller diameter ducting. The smaller the duct size, the more force you will need to overcome the static pressure created. This is multiplied if you are reducing the size of the duct coming from the fan to match the rest of the system. For instance going from 6” to 4” will have a big impact. Duct Length: Lets stay with our straw illustration. Take 20 straws and put them together. You will notice you can still get some air through them, but once again, it takes a lot more effort. A shorter duct length will create less static pressure. 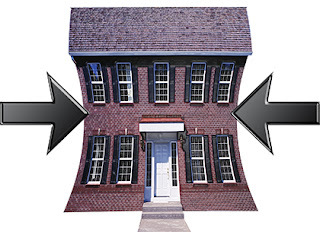 Twists and Turns: Each time you add an elbow or turn in the ductwork, you add more static pressure. Its been working so far, so lets stay with the straw. Now take the straw and bend it into 10 different twists and turns and try to blow air trough it. Each time you add a twist, it will get harder to move air through it. Great, we now know about Static Pressure, but what’s the big deal. As we learn more about indoor air quality and the benefits of proper ventilation, it is vital that the systems are working as expected. As we saw in the above example if the home calls for 100 CFM of ventilation but because of the static pressure in the system, we are only getting 90 CFM or worse, we have an issue. In extreme cases you might only be getting a fraction of the airflow you thought. This can lead to moisture issues like mold and mildew.